Our photograph shows BBC newsreader Nicholas Owen, a long time supporter and fundraiser for Volks Railway, cutting the ribbon on the beginning of the 2015 season; he is assisted by Stuart Strong, Volks Railway Manager. Today is the first day of the season which runs from Easter to the end of September. Trains run every day until the end of the season, weather permitting. Volks Railway was the first public electric railway in the world; it was opened on 4 August 1883 by Magnus Volk. Today the railway can carry up to eighty passengers along the beach for one and a quarter miles. 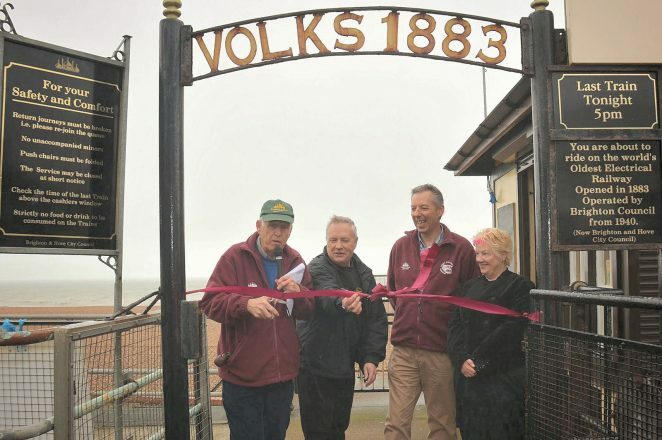 A trip on Volks Railway is a wonderful experience for all the family; the stations are all wheelchair accessible.